Lifeline – Great for the brain, necessary for the soul. ZOMG it could be rare! Because of this overstimulation, many health experts tout the benefits of meditation, slowing down, and taking a moment to take a few deep breaths. After all, as much as we think Red Bull and Mountain Dew can keep us at our peak, we need to recharge. You'd probably get sick eating cake every day (at least Wilford Brimley says so), and that makes sense. A good protein and veggie meal is what your body NEEDS to stay alive, even though from a chemical and emotional standpoint, we are craving the cake (which is a lie, btw). Enter Lifeline, the gaming equivalent of relaxing, eating your vegetables, and reading a book (that’s still a thing). You see, after the whopping 18mb download, you’ll find that it just opens a portrait-oriented window on your screen that has some text scrolling by. WHAT?! Yep, just that. Lifeline is a no-frills, use-your-brain-and-imagination experience that will allow you to slow down your heart rate, and flex the parts of your cranium that may seldom be used anymore – imagination. Most titles give you tons of blinky lights, explosions, textures, and fun noises. 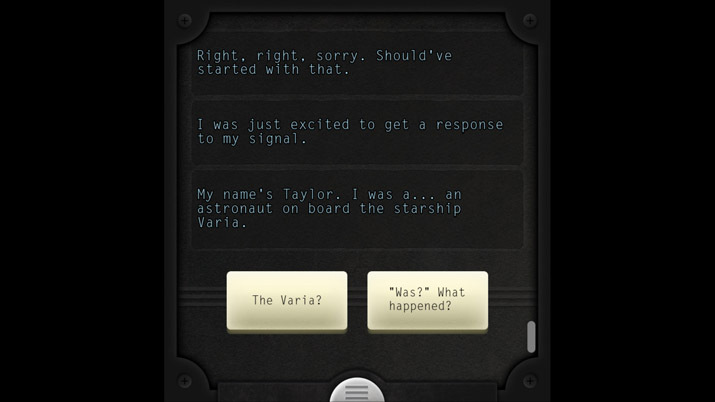 Lifeline gives you text, and really nothing else. This makes you envision what’s going on, and it’s great at it. The gameplay and story are both quite simple. 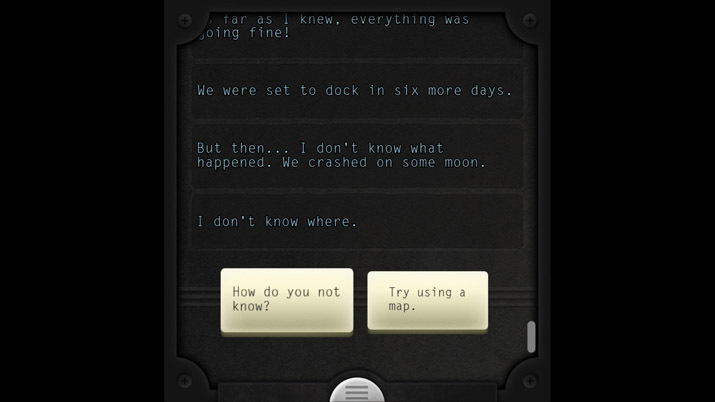 A space crash survivor contacts you, and you guide him through forks in the road (sometimes literally) in the hopes of helping him not die. If you’ve seen The Martian with Matt Damon, it’s kind of like that, except imagine if he was really needy and couldn’t make any decisions on his own. Early in the experience, you’ll soon realize the choices you make have real, tangible consequences. For starters, our protagonist Taylor is specific about how long some things take. If he says that smoke in the distance looks like it’s an hour’s walk away, it’s going to take him an hour to get there. You will literally be able to do nothing until he gets there… for an hour IRL. At first, this was very frustrating to me. I would even alt+tab over to another title and play for a bit, returning to check on progress. I also found that if you X out the game, it becomes a system tray icon, so it's almost as though they anticipated you would do other things. But as time went on (pun intended) I came to appreciate these breaks. I made a conscious effort to not play other games and instead would go for a jog, toss dinner together, or do things that didn't involve blinking lights and explosions. Though I was patiently waiting and not playing the game, I still felt a thorough sense of accomplishment. I learned to consider Taylor's choices carefully and even had to use good ol’ Google to answer some of his questions. Before you judge me, do you happen to know if 150 rads of radiation will kill a person? I didn’t think so. Honestly, because it's so simplistic in nature, it's difficult for me to tell you much more without spoiling the story. I can say though, that the writing will make you chuckle at times, and you’ll find yourself waiting for Taylor to get back from his current task to find out what the next step is. Just like reading a good book, it will take you a moment to become emotionally invested in the main character, but if you’re the type of person that likes to read and watch a story develop, then you’ll be pleased with this release. Be mindful that if you pick this title up, which I think you should, you’ll be doing all the legwork in your brain while still keeping your heart rate down. Though simple and straightforward, and thoroughly enjoyable, this style of gameplay is not for everyone. That said, take some time away from the crazy stuff and chill out with Lifeline. Hats off to the dev for putting together a great story in an elegant, minimal package that still brings it home.